As most of our fishing is done in Torbay, we thought that it might be useful to include a guide to some of the more popular sea fishing marks. We have also built in links to the various webcams around the bay, which can be very useful if you want to have a quick peek at the sea before actually going fishing. If we have missed any, please let us know. I have been asked to give the website addresses of where to buy 'The Challenge of Sea Fishing' and 'The Challenge of Inshore Boat Fishing' - which are in Kindle formats as e-books. These links will take you straight there if you are interested. I have also just released 'Why Sea Fishing with Lighter Tackle Rocks'. Signed paperback copies of 'The Challenge of Sea Fishing' are available to UK mainland addresses at £12.99 including postage and packing. If you would like a short message and a signed copy, please use the text field (right) to tell me. Tackle Zone is an area where we look at articles of sea fishing tackle that tickles our fancy. It includes reviews on tackle and a guide to some of the tackle shops in and around Torbay. Although our articles have detailed pictures of rigs in them, sometimes it is nice to be able to quickly refer to specific tackles. This link takes you to information about the pulley rig, up and over leger and running leger. Click on links below for webcams. This latest book contains a lot of information that is useful for beginners and more experienced anglers alike. 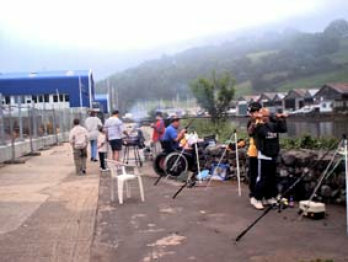 Welcome to www.seafishing4fun.org, the website of Baywater Anglers, a sea fishing club based in Totnes and Torbay. We are a family club committed to encouraging others into the sport of sea angling and helping those who are already involved. As you browse the site, you will find information on shore fishing, rigs, boat fishing, bait and other areas that tickle our fancy, such as the occasional sidestep into the world of fly fishing in saltwater - often referred to as 'saltwater rodding'. Each of the photographs at the side of the page opens up several articles on the species in question. Just click on either the picture or label to access them. Bass are one of the most prized of the sea fishing species, being a handsome, silver fish that fights hard and is tasty to boot. It also responds well to light tackle, whether it be fishing from boat with light baitcasters or float-fishing from shore with a match rod or similar. This link will take you to articles on bass fishing from shore, bass fishing from boat, estuary fishing, fly fishing, sandeels and bassing at Lannacombe. Cod are one of the angler's favourite fish, with the capture of a large specimen a red letter day in almost every angler's diary. In this section, we look at shore fishing for cod, wreck fishing for cod, uptide boatcasting and also a quick peek into its lifecycle. Garfish may not be everybody's cup of tea but catch them on light tackle and they may well surprise you. Personally, I think that they are one of the most sporting of the British sea fishing species and very much enjoy fishing for them using ultra light tackle. Click on the link to find out more about fishing for them from both boat and shore. Plaice may not be one of the most sporting sea fish but, given the right tackle, they can put up a game scrap. 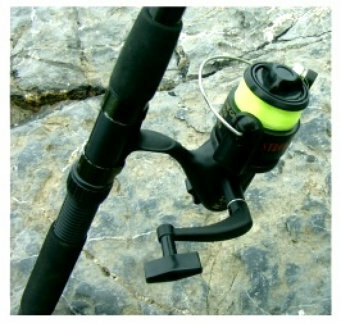 Baitcasters and light sea fishing rods especially will give them a superb chance to perform. Here we show you how with articles on the fish itself, ragworms, shore fishing, including tandem traces and finally boat fishing techniques, including the highly successful predator rig. Pollack can be great fun for sea anglers, whether it be miles from the shore, drifting slowly over a wreck, or casting out from a rocky headland. Here we offer some advice on some of the most popular sea fishing strategies for these wonderful fish, including fishing for them from shore, boat and wreck fishing and fly fishing together with a peek at some of the most successful artificial lures. Wrasse are often one of the first species caught by sea anglers, hugging the rocks close to shore so that distance casting is rarely necessary. We look at several unusual sea fishing strategies, like pole fishing from the shore or using a variation of the flying collar rig from boat. Articles include fishing for wrasse from shore, fishing for them from boat, prawns and background information on the fish itself and, for those who like to experiment, pole fishing, including both methods and setting up a pole for use in the sea. Recently, we took a trip to Portugal. This article contains some of the things that we found out about the fishing during our visit.